We have a spelling program at our school and a basal reader that has 5 to 6 vocabulary words per story, but we do not have a formal vocabulary program. We use to use Wordly Wise and I absolutely loved it! Yes, it was difficult for the students at first, but they rose to the challenge and mastered those words. I loved hearing my fourth graders say "I found a Wordly Wise word!" while doing independent reading. Unfortunately, our school got rid of this program and I have struggled to fill the void. I use the spelling program's 20 words as a weekly vocabulary, but these words are very easy! To supplement this I created a root word packet for our word study. We add a root list of a few words to the vocabulary. Below is the root list that I use in the classroom. 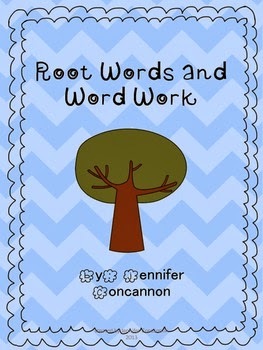 It comes from my TPT root words and word work pack. The pack contains many graphic organizers to reinforce the vocabulary for the students. It also includes a differentiated weekly root word menu. I love using menus in the classroom since it gives the students choice and they are able to work their strengths. Click the picture below to be taken to TPT or click here for my new Teacher's Notebook store and get the word work! How do you use root words in your classroom?